Eyes down for a full house! 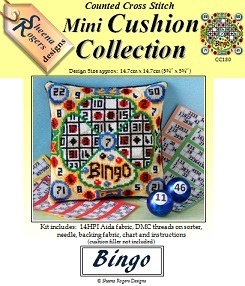 Ideal for fans of the Bingo game, this design features motifs of the bingo balls and number cards. Around the edges of the design you'll find images to match the 'bingo lingo' of a key to the door (21), bullseye (50), two little ducks (22) and bang on the drum for 71. There is also a lucky number seven in the centre. Only whole cross stitch is required to complete this mini cushion design so no fractionals or backstitching required.